Our portfolio company Indeed has done something pretty neat. 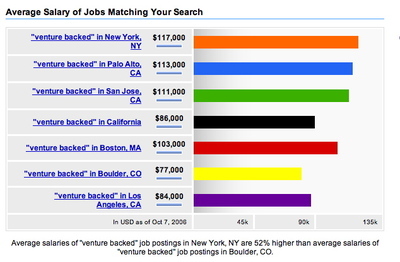 They’ve culled salary data from millions of current job listings and made it searchable. Of course, the obvious thing to do with this is look for jobs that pay what you want to make. But there are lots of other uses. Like this analysis I did of the average salaries of "venture backed" jobs in some of the major VC markets. I’ve added this chart to my right sidebar, right under my Indeed jobroll with an ad for joining a startup in NYC because "it pays more!". Indeed explains their methodology for this salary search on the Indeed blog. Give it a try, it’s fun and informative. Newer post Baby Please Don’t Go Older post Is The “Traditional Venture Capital Model” Broken?